Apart from helping to organize a playroom or garage, lockers are also a great way to support your favorite sports teams. Introducing the new 2013 Home Team Lockers from Hallowell. 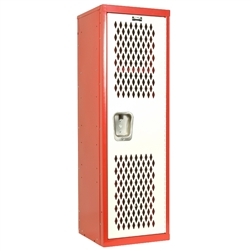 Brought to you by the same company that created our popular Kids Lockers and Mini Kids Lockers, these Home Team Lockers are perfect for any die-hard sports fan! Compared to our classic Kids Lockers, these new Home Team Lockers look like an entirely new breed. 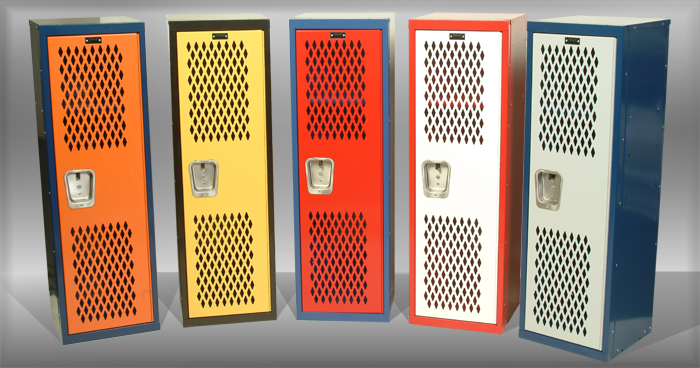 Equipped with a multi-color finish to match your favorite sports team, these lockers seem to be a tougher, edgier version of our standard lockers. Durable 16-guage metal doors incorporate diamond-perforated holes, allowing anything you store inside to ventilate and breathe. Rubber bumpers located on the inside of the door ensure the door will never slam and fits snugly when closed. Stainless steel, recessed-handles install flush on the outside of the locker door, allowing for ease of access while keeping the unit confined and compact, perfect for any space. Even from afar, you can tell that these lockers are a bit different from our classic Kids Lockers. 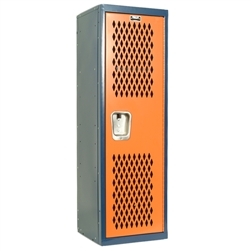 Firstly, the 6″ legs that would come standard on our normal lockers are absent on the Home Team Lockers. This change is intended to add more balance to your locker by lowering its’ center of gravity, while preventing the unit from tipping. The flat metal base of the locker allows it to sit upright and level on any flat surface. 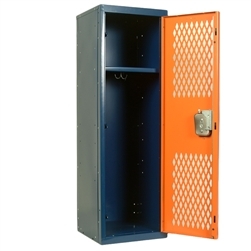 These lockers are very versatile and can be used anywhere to store just about everything. Since when do lockers have to stay in the garage or basement? Standing at only 48″, these lockers don’t take up a terribly large amount of space. 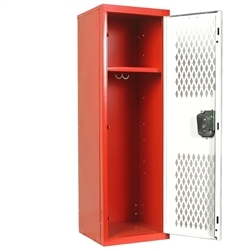 Compared to our standard lockers, these units stand about 6″ shorter, making them the perfect candidate for smaller storage areas or confined spaces where storage is limited. While they shortened the overall height of their Home Team Lockers, Hallowell did a great job of keeping the space on the inside at a maximum. Contrary to popular belief, lockers can serve a multitude of functions that reach far beyond storing old, unruly sports equipment. Re-imagine your Man-Cave with Hallowell’s Home Team Lockers! 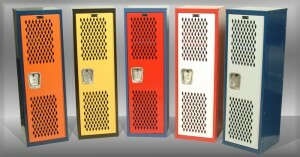 Available in a variety of colors, these lockers make the perfect display piece in any sports room. Store your team’s hats or other memorabilia in the convenient 9″ hat shelf, located at the top of the locker, just inside the door. Equipped with double coat-hooks underneath each shelf, these lockers make for the perfect place to hang your favorite jersey or other sportswear. Why spend hundreds of dollars on a fancy glass display case when you can incorporate both durability and style with our new 2013 Home Team Lockers? Built to last, these lockers are perfect for any garage or man-cave, big or small. Don’t wait, pay tribute to the teams you love by adding one of these lockers to your storage collection, or surprise your family and friends with one of these awesome gift ideas today!